Many people might be unaware of the fact that they can purchase used wheelchair vans. You do not have to buy a brand new vehicle when you need a handicap accessible vehicle. At R&R Mobility, we want to make it easy for our customers to find the car that will help them regain their freedom. Below are just two ways you can customize a used wheelchair van. Add Ramp or Lift- By choosing a handicap ramp or lift, you are making it easier to get in and out of a vehicle. There are many benefits to both of these unique features, but it is vital to choose the one that is right for you because you will be using it every day. Removable Seats- Our team can make specific seats removable for your convenience. If you have to share the vehicle with someone, you will need to have the option of swapping around the seats. Many of our used wheelchair vans already have many of these features, so you will not have to worry about adding in all the accessories you need. However, if you find a vehicle without any of the accessories you need, our team is ready to customize a vehicle for you. Call us today at (866) 605-1596 for additional information. Choosing between a wheelchair ramp or wheelchair lift for a vehicle can be a difficult decision. You want to pick the one that will be easy to operate and efficiently accommodate your loved one’s needs. 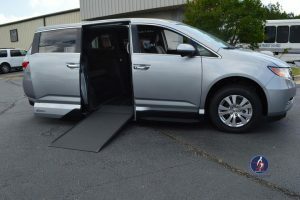 If you are looking for a handicap lift or handicap ramp for a van in Atlanta, you can turn to R&R Mobility for a diverse selection. If you already own a vehicle, our devoted team will help customize your vehicle to your exact needs. We want to help you choose the right option for you, so we created a list of benefits for the ramp and lift. Each ramp has a slight incline that makes loading and unloading easy. Easier to use because a machine will lift the wheelchair into the vehicle without any additional effort from the individual. Ramps come in a variety of types, so you can select the one that is the easiest to operate. Some ramps fold in different directions. Depending on the type of lift, it can attach to rear and side doors of vans to make it more convenient for everyone. Takes up less room inside the vehicle. You can pick from various styles. If you are still hesitant about which option is right for your family, you can contact us at (866) 605-1596 so we can walk you through an in-depth detail of each one. The holidays are quickly approaching and it is essential to spend time with family members. It can be challenging to visit each other when they live in other states. Taking long road trips just got a little more comfortable if you have a wheelchair accessible van. At R&R Mobility, we are here to help you purchase the van that is right for your needs. We produced a list of three reasons your family should have a wheelchair van during the holidays. Visit Family- If you or a family member has a disability, it can make traveling long distances overwhelming. Our wheelchair accessible vehicles make traveling convenient and straightforward for the whole family. Spacious- No one should be uncomfortable when in a vehicle. We can customize vehicles to your family’s needs to ensure everyone is comfortable. We even have under vehicle lifts available, so you can enjoy more space inside of the van. Memories- Family road trips are always filled with moments that you will cherish for the rest of your life. Whether it is singing along to favorite songs or following the wrong directions, you are bound to have some memorable moments when the entire family is in one vehicle. If you are not ready to purchase one of our wheelchair accessible vehicles, you can rent one to visit extended family members. Don’t forget, the holidays are about spending time with one another. Contact us today at (866) 405-6807 for additional information about our current inventory and rentals. Renting a vehicle can be a challenge if you or a family member is in a wheelchair. 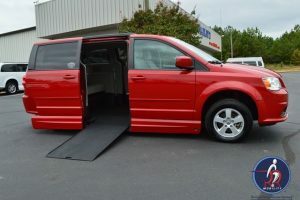 At R&R Mobility, we want to make it easy for everyone to rent a wheelchair van in Georgia. Whether you are flying into the airport or taking a family road trip, you can turn to us for quality and dependable wheelchair accessible vans. Listed below are three of the many reasons to rent a wheelchair accessible vehicle from us. Convenient- We offer delivery and pickup services for our vehicles to make it easier for our customers. If you are at the Atlanta Hartsfield Airport, it is $100 to deliver and $50 to pick up. We offer FREE delivery and pick up services at the Shepherd Center, and all other delivery and pick up charges may vary. Accessible- Our vans are converted with automatic ramps and kneeling features to make it easier for you or a family member to get in the vehicle. 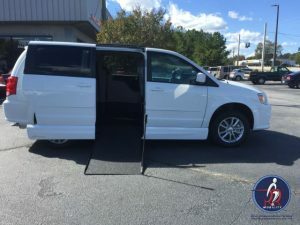 Comfort- By renting a wheelchair van in Georgia, the entire family will be more comfortable with the space our wheelchair accessible vans provide. If you are interested in renting one of our wheelchair accessible vehicles, you can call us at (866) 405-6807 today. We will provide all the information you need to know about our pricing and driver requirements. When it comes to maintaining your vehicle, you should trust the people you bought your wheelchair accessible vehicle from. 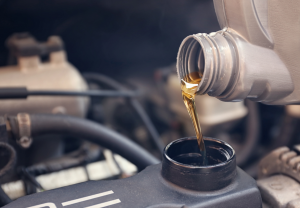 Our knowledgeable and trained staff can work on your car to ensure it is running correctly. Whether you need a routine oil change or your front end aligned, you can rely on R & R Mobility Vans and Lifts. Here are some of our full-service automotive repair services. When it comes to your wheelchair accessible vehicle, you trust us to work on the ramp and lift, so why would you want to take it somewhere new for full-service repair and maintenance? Let us be your one-stop shop for your entire automotive repair needs. If you know you need a specific part ahead of time, you can let us know and we will make sure to have it in stock before your appointment. If you want to schedule an appointment or need additional information about our wheelchair van repair services, you can give us a call at (866) 405-6807 right now. We are accommodating when it comes to our customers because we understand you have a busy schedule. Here at R & R Mobility Vans and Lifts, we want to provide our customers with peace of mind when they are driving, which is why we offer a Roadside Assistance Plan for our customers with wheelchair accessible vehicles. This plan is designed to help you in case you experience car trouble. We work with over 35,000 tow providers throughout the country. There are many benefits to our plan, but we listed the top three below. Wheelchair Passenger Transport- We understand that waiting on the side of the road is not always an option when you have a person in a wheelchair. With this plan, we provide passenger transport for those in the disabled vehicle up to 25 miles at no charge. Flat Tire Assistance- If you have a spare, we can replace your flat tire with your spare. If you do not have an extra tire or you have more than one flat tire, we will tow your vehicle for you. 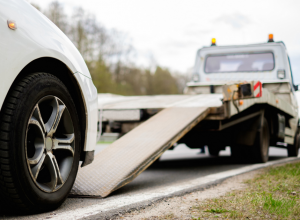 Towing Assistance- We can tow your vehicle up to 100 miles if you are having engine trouble, but after 100 miles additional charges will apply. Some of our other services include locked-out assistance, out of fuel, winching, and battery service. These are just a few of the many benefits you can count on when you register for our Roadside Assistance Plan. Give us a call right now at (866) 405-6807 to sign up. Check Your Tires – As the weather starts to change, it’s vital that you start thinking about your tires. The change in the temperature can affect the pressure and, if you do not adjust it as soon as possible, you may damage your tires or experience a problem while on the road. Clean Everything Out – This is also a great time to start cleaning out your vehicle, as you may have residual items in your vehicle that you won’t need until next summer. You should remove any summer gear and start loading up on things you might need for the fall. This is a great time for a little interior detailing! 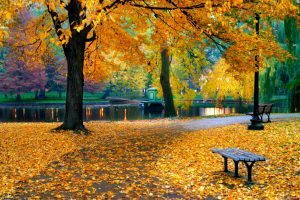 Test Your Heater – Most vehicles have no problem heating up every fall and winter, but it is judicious to be proactive and determine any concerns before it becomes an issue. Whether you are driving alone or with your family, no one wants to be caught in a situation where they are without heat on a cool fall evening or cold winter morning. This is also a great time to look into investing in a new wheelchair accessible vehicle. 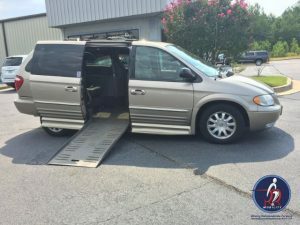 R&R Mobility is proud to provide a wide array of new and used wheelchair vans for sale in Georgia. Give us a call at (866) 405-6807 for more helpful tips. What Vehicle is Right for My Needs – Before you even start looking into purchasing a vehicle, you should make sure you are looking for a vehicle that will fit your needs. You can speak with a mobility consultant about the kind of vehicle that is right for your needs or with friends and family who may also have wheelchair accessible vehicles about their experiences. Read the Reviews – Thanks to the Internet, you have access to reviews of all types of information, including wheelchair accessible vehicles. It’s a good idea to read some of the reviews to get a better understanding of what other people are saying as you start your search for a wheelchair accessible vehicle. Speak directly to a dealer about Your Needs – Whether you have found the vehicle you want from online or have visited in person, it is recommended that you speak directly to reputable dealer about your specific needs. A reputable dealer will be happy to discuss any details or concerns with you to make sure you happy with your investment to meet your needs. When you are in the market for wheelchair accessible vehicles in the Southeastern US, you can trust the team at R&R Mobility to provide you with a variety of new and used selections. We are here to help you get your mobility independence back. Call us today at (866) 405-6807 to get started. Special Finance Programs – A variety of programs are available for financing mobility vehicles including loans with extended terms, leasing packages and more. Please ask your mobility consultant for more information about special financing programs offered. Finding handicap vans for sale can be an adventure, especially if you are looking for a specific type of vehicle. At R&R Mobility, we have a wide assortment of vans, trucks, and cars to suit your needs. We can also install accessories to make your current vehicle more accessible. 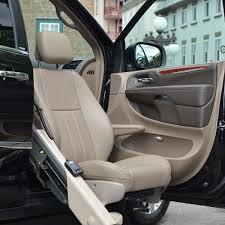 We will briefly discuss some of the benefits of having customized seating or accessories installed in your vehicle. Investment- These seats can be reinstalled when you purchase another vehicle. These seats become a long-term investment because you can continue using them even if you buy a new vehicle. Peace of Mind- Whether this seat is for you or a loved one, you will feel confident and comfortable when getting in and out of the vehicle. The fear of falling is one that many people experience, but this seat allows for ease of mind with secure positioning and installation. Upholstery Options- These seats will coordinate with the interior already in your vehicle. Depending on the style you choose, the seats are available in leather and fabric. Let our team customize your vehicle to meet your specific needs, whether you need a wheelchair ramp accessible seating or specific accessory. To inquire about our services and vehicles, give us a call today at (866) 405-6807.